Capital expenses are either amortized or depreciated depending upon the type of asset acquired through the expense. 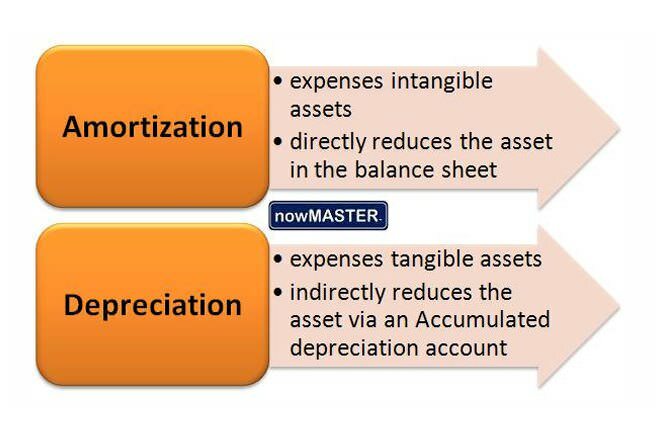 Tangible assets are depreciated over the useful life of the asset whereas intangible assets are amortized. A way to "recover costs" i.e. account for capital expenditures. A way to "recover costs" i.e. account for capital expenditures. When a business spends money to acquire an asset, this asset could have a useful life beyond the tax year. Such expenses are called capital expenditures and these costs are "recovered" or "written off" over the useful life of the asset. If the asset is tangible, this is called depreciation. If the asset is intangible; for example, a patent or goodwill; it's called amortization. As an example, suppose in 2010 a business buys $100,000 worth of machinery that is expected to have a useful life of 4 years, after which the machine will become totally worthless (a residual value of zero). In its income statement for 2010, the business is not allowed to count the entire $100,000 amount as an expense. Instead, only the extent to which the asset loses its value (depreciates) is counted as an expense. The simplest way to depreciate an asset is to reduce its value equally over its life. So in our example, this means the business will be able to deduct $25,000 each in the income statement for 2010, 2011, 2012 and 2013. In our example, let's say the business decides to use a depreciation rate of 40%.